Discussion in 'Flashcart Help' started by doherty123, Apr 13, 2015. So recently i've been trying to add or edit codes using r4cce (cheat code editor) on my R4 card for Pokemon Platinum with little success. The code i wanted to use was the shiny pokemon encounter one but when i opened the usrcheat.dat file i realised the code was already on there but it wasn't showing up when i tried to select the cheat on my DS. I've tried editing and changing existing codes on the usrcheat.dat but when i go to select them on my DS they appear as if they haven't been changed at all, even the name of the code stays as it was originally. I've also tried replacing the usrcheat.dat with a new one with just the Shiny pokemon code on but when i do that my R4 crashes when you go to the games screen. Probably because the GAME ID of your ROM and the database's didn't match. Use R4CCE.exe, ADD NEW, press [...], load the rom, and you should be able to take note what the ROM's ID. Edit the usrcheat.dat with that ID. Also whenever you edited, choose SAVE. The game ID is correct (probably should've mentioned that). 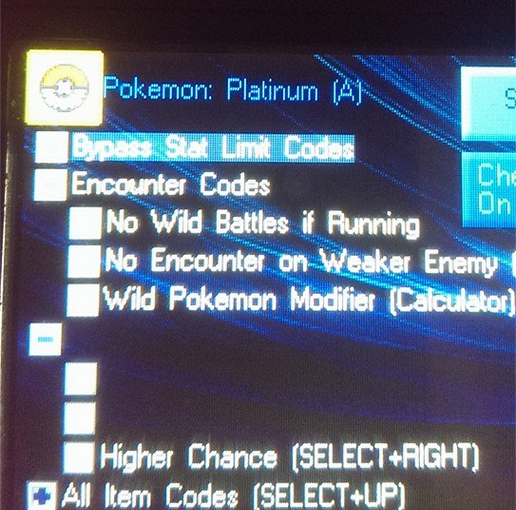 As i said in the first post it's only certain codes that wont show up, every other code i've tried works fine but this specific code (shiny pokemon) and a few others wont actually show up in the cheat code select screen on my DS. You might need to run the R4CCE in admin mode. In any case, I try checking on both the pre-existing code in the usrcheat.dat and added the code I gave you earlier. Both work just fine. 7. Done, copy it to your SD Micro. I did just that, and it was working fine. First off, NEVER use cheat codes for pokemon game. it will corrupt your data(precautionary warning). second did you check to see if your rom dump [read-only] was unchecked. sometimes this will prevent cheats from happening. AND last did you soft reset, when you checked the cheat code. hard reset or power off sometimes turns off cheat codes, and no reset wont activate them. First off, NEVER use cheat codes for pokemon game. it will corrupt your data(precautionary warning). they could do that to any game. you're modifying code while it's running, the results are undefined and completely unpredictable. Best case it will have the intended effect or do nothing, worst case it will corrupt your save and/or crash the game. Well instead of cheat coding, the safest way to either get all the pokemons, or alter them in a way that avoids corruption, is to use pokemon generator. By dumping your save, doing what you want to your pokemon then reinserting it wont have any nasty sideeffects. when you use cheat codes, you permently alter you save data(if you are lucky), meaning even if you turn it off or try to use another cheat code, it will always be there and multiple cheat will cause serious issues that do result in lost saves(sorry). rom dump is the rom you are using. im hoping its an .nds file. what specificly cheat code are you wanting to do? Yes its an .nds file and the code is the Shiny pokemon encounter code as seen in the picture of r4cce which is already on the usrcheat.dat file but doesnt show up as seen in the picture of my DS. I've tried adding new codes and editing existing ones but nothing changes when i do it, the codes either stay as they were originally or just dont appear. Im starting to think its either my R4 card messing up or maybe the rom im currently using is bugged? UPDATE: I've noticed i can delete codes off the usrcheat.dat in r4cce but when i go on my DS the deleted codes still appear and i can select them to use. I'm quite sure you don't know how to properly edit the usrcheat using R4CCE, if you had done it properly, the changes should have been reflected in your console screen. See also in your SD Micro folders if there are more than one usrcheat.dat in it. Your R4 might be reading the file which you didn't edit. Make sure to try untick the cheats in the R4, save it, and then re-tick it. And avoid activating too many at a time. Trust me when i say i know exactly what i'm doing (hope that doesn't sound pretentious xD). There's only one usrcheat.dat file and i should probably say i'm not new to using R4 cards so i know how to use cheats properly, i just haven't had this problem before. Could you link me to the ROM you're using for Pokemon Platinum? That's ok, I was merely trying to deduce where/how it could have not work. Could you probably try removing your Save File from the SD Micro temporarily, and test play from the beginning? Just to see if the save file has anything to do with the issue. After all, applying AR cheats will result to tempering the save file which could and possibly would render several problems, including crash/glitch. I've tried removing the save file and also creating a new one but i get the same problem so i don't think it's the save file. That's the same rom i'm using so I've tried switching to a different one but i still get the same problem. Do you think my R4 card could just be on its last legs? No I don't think that be the case. Your R4 works fine far as I can tell from your post. It's just that I'm finding it weird your cheat file isn't read properly by it. Just tried using a different R4 card (same version) and SD card which yielded the same results, do you think it could be the verson of the R4 card not supporting certain codes? can someone help me out? ive installed the cheats on my DS and they show up but they wont get enabled when i boot the game up? am i doing something wrong? 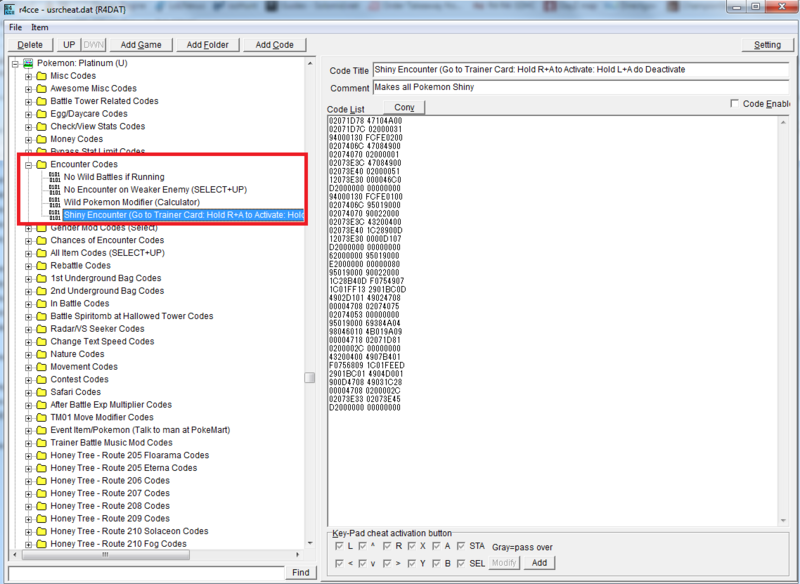 Likely the cheat code's registered GAME ID doesn't match with the Game Rom's.